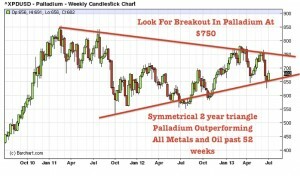 Turning Point In Precious Metals and Miners? 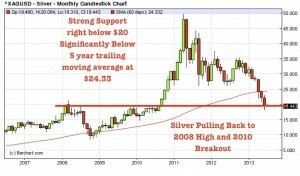 During silver’s and gold’s terrific move in 2011, very few analysts warned that a correction could come to shakeout all the Johnny come lately’s (momentum traders) who were pushing gold and silver to nosebleed levels. I got nervous as hell back in 2011 when the day traders and mass media started picking up the precious metals story and I warned of a correction. I sent this chart to my readers forecasting a bullish reversal this month for the Gold and Silver Index. In April of 2011 I was interviewed by CBS Marketwatch and was quoted saying, “I am very concerned that silver may be overheating as the herd tries to force their way into this trade.” This drastic move higher was to me a warning sign that we may see a significant shakeout. I wrote articles published all throughout the internet at the end of 2010/2011 warning my readers to protect themselves from a shakeout or correction. See the article entitled, “Is a Healthy Correction Overdue In Gold and Silver?” These same analysts who told you to buy silver in April 2011 or to buy gold in September 2011, at record highs are the same ones telling you to short or sell it late June-early July at record lows. Beware of the mainstream media as it uses the momentum guys to brainwash the masses to buy high and sell low, when in fact our job is to do the opposite, buy low and sell high. Do not let these myopic minds confuse you. I continue to teach the basic fundamental philosophy in investing that has been proven time and time again in my premium newsletter, buy straw hats in winter when no one wants them and wait to sell them when the summer heat wave hits. It is this simple and contrarian value philosophy which has proven to build great wealth over time. In the markets, the hardest thing to do is to move against parabolic moves on the upside or waterfall declines to the downside. These technical phenomenons are pictures of mass hysteria which historically prove to be turning points in the market. Panics are represented by exhaustion gaps lower, while parabolic moves are represented by price spikes. Do not forget the basic laws of nature such as reversions to the means when investing in the markets. What goes up eventually attracts the late coming, marginal, momentum trader who eventually gets destroyed. What goes down attract the savvy value investors. Corrections or panics destroy the weak hands who bought near the top and value investors acquire the positions to eventually sell in the next up-move. This phenomenon may be occurring right now. The momentum trader may be chasing equities to overbought levels. The time to buy equities was when the S&P 500 at much lower levels back in October of 2011. When no one was buying the S&P500 that was when I signaled a major buy signal for equities. Similarly, back in 2011, silver and gold’s vertical ascent signaled profit taking time. These movements are the best signal for a coming painful correction. 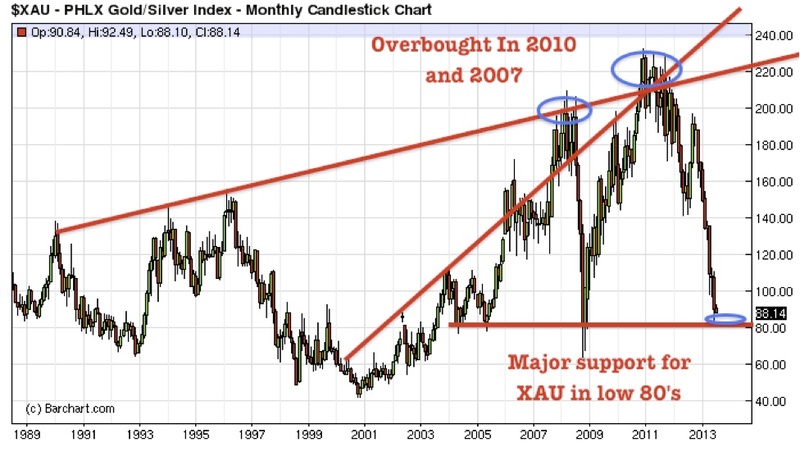 Recent waterfall declines in gold and silver below 5 year trailing moving averages and hitting historic oversold valuations are indicative of a major once in a generation bottom. We are hitting thirty year lows in the resource arena. Eventually, the precious metals sector will turn back higher and hit new inflation adjusted highs. Look for a break above the 50 day moving average which on the GLD is right now $129.08 and on the SLV at $20.40. 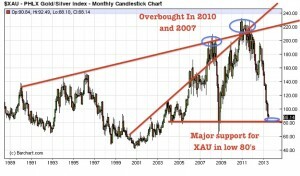 We will observe the public return to the precious metals market similar to 2011. Geopolitical turmoil is increasing with riots in Turkey, Egypt and Brazil. Extremist Iran is advancing on a nuclear weapon. Fiat currency markets could be on the verge of breaking down as competitive devaluations are taking place around the globe. Credit downgrades and sovereign debt issues are now riskier than ever as interest rates are beginning to rise. Keep a close eye on silver below $20. The herd may have been exiting to the sidelines and selling their precious metal positions in panic during the summer goldrums, which is a historically weak time for the sector. Investors should be scaling into bargain mining opportunities as waterfall declines or panics are indicative of a potential “V” shaped bottoms and signals capitulation or the end of a bear market. Precious metals are trading below 5 year trailing averages and the miners are able to be bought at a significant discount. International Tower Hill Mines (THM) is one example of a bargain basement opportunity. They control over 20 million ounces of gold in mining friendly Alaska and it's trading at less than $5 per ounce of gold. This provides incredible leverage to a rising gold price as the company is on the verge of publishing a Bankable Feasibility Study, which is a crucial technical document which the majors study to see if a project is economic. International Tower Hill Mines is on track to deliver a bankable feasibility study to the market shortly. The company is in discussions with strategic partners to develop this large 20 million gold ounce deposit near Fairbanks, Alaska. The company is trading at record lows as the junior mining market has been in a two and a half year correction. In addition, the company has been working for over 18 months on the feasibility study for a project that is still years away from production. However, the company is on the verge of publishing this critical document which could prove the viability of this resource. There are multiple scenarios to get this into production should gold stay discounted. The project is located in one of the best geopolitical jurisdictions in the World. Being located near Fairbanks, AK has many benefits as the infrastructure is excellent. The Feasibility Study should soon derisk the Livengood asset and bring recognition back into this project. Investors need to look in the right location for a potential mine. Kinross operates the Fort Knox mine successfully nearby. Incidentally, Tower Hill has some of the key technical personnel who helped build and permit Fort Knox currently working on the Livengood Bankable Feasibility Study. Listen to my recent interview with the CEO of International Tower Hill Mines as we discuss current progress in 2013 and potential developments in the second half. As prices have declined demand has soared exponentially. I am a long term precious metals and wealth in the earth investor, but when you start seeing parabolic moves to the upside it is time to protect oneself from inevitable gut wrenching pullbacks like we are currently seeing. However, when you see panics and capitulation, like we are seeing this summer, that may be exactly the time to continue adding to precious metals and wealth in the earth investments. This recent decline in precious metals is due to a recently strong U.S. dollar as other currencies such as the Yen and Rupee hit new lows. The Chinese and the Japanese are on the verge of its next major liquidity boost. The U.S. may need to increase QE, rather than taper to keep pace with the other industrial juggernauts. China and India are buying physical bullion like crazy. China actively encourages domestic retail purchasing of precious metals. India is attempting the opposite, trying its best to prevent a massive bank run as I write this. Indians are buying gold and silver hand over fist as the rupee is falling hitting all time lows. Premiums for physical gold and silver are reaching records. The Indian Government is trying its best to prevent record buying of precious metals as the Indian economy is on the verge of deteriorating fast. As bullion declines in terms of U.S. dollars, we are seeing surging demand from India and China. Precious metals ownership is deeply valued by the Indian people and attempts to curb purchasing could backfire as it could cause complete trust in the economic system. The Indian Government is extremely concerned about financial risks as corruption scandals in the Government in India are increasing. Do not forget India is surrounded by radical Islamists. Inflation is soaring rapidly in India as the U.S. dollar strengthens. Many Indian funds are looking to diversify away the deteriorating Rupee. Capital is searching out junior mining opportunities in precious, industrial metals and energy. The junior miners can raise capital as highlighted by the $11 million going into the Yukon this past week and a series of deals in the potash sector. The issue is many junior miners are buying back their own shares and want to avoid dilution at these ridiculously low prices. The miners may be waiting for a rebound before allowing increased purchases and friendly M&A to occur. Look for imports of precious metals into China and India to rise as demand increases. Premiums for physical gold and silver are still high. Just like the miners declined before the bullion price in 2011, I expect the miners to begin outperforming to signal the next leg higher in precious metals in 2013. Funds need real wealth in the earth more than ever as the bond and fiat currency market is in danger of freefall. The miners performance in relation to bullion is a good indicator to forecast an eventual upturn in the metals. This correction in gold and silver may be fooling the masses to think the bubble has popped and that the long term bullish trend is over. I don’t believe this. Eventually, precious metals will hit new all time inflation adjusted highs which has heretofore not been hit. The miners could one day be richly valued above 2007 highs or thirty year highs, not thirty year lows. Savvy investors who believe in the long term uptrend in gold and silver should continue purchasing precious metals and miners at a discount and take advantage of the fear, rather than becoming another victim chasing the equity, bond and greenback market. One may consider favoring the white hot precious metals, silver, platinum and palladium, over gold. These white hot metals are both used as a monetary metal and as an industrial metal. Platinum and palladiums major use is in catalytic converters as the metal mitigates noxious air emissions. India and China are dealing with major smog issues in major cities and are setting up major restrictions on the auto manufacturers which will require more platinum and palladium. Recent violence and turmoil in South Africa and increased tensions with Russia over Syria could significantly impact potential supply for North America and Europe. 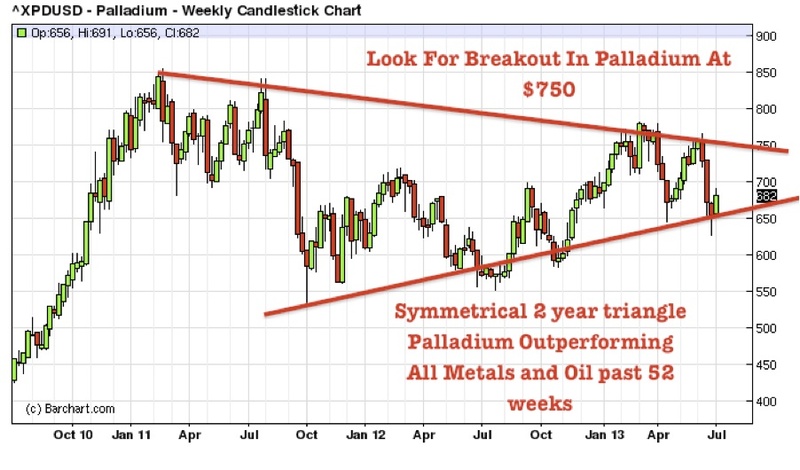 Palladium is the only metal up in the past year over 19% outperforming both the S&P500 and crude oil. It is showing great relative strength and may be on the verge of a major breakout. Check out this platinum and palladium miner in the Yukon which recently raised close to $6 million and has just started their summer exploration activities. As the CEO recently stated, "Our asset is one of the largest PGM resources outside of southern Africa and Russia and, with the sector confronting protracted global supply issues, we are looking at a number of opportunities to expedite this important project's path to production." Disclosure: Author/Interviewer is long precious metals and International Tower Hill Mines. THM is a sponsor on website.